Hi Lovelies! 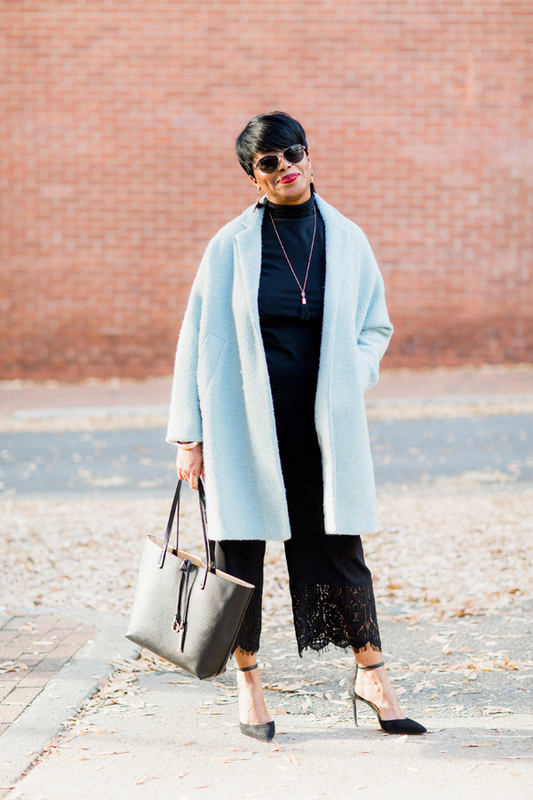 Today I'm sharing one of my favorite coats with you, my blue ASOS Swing Trapeze coat. I actually purchased this coat about three years ago. It's such a classic and will never go out of style. I love it! I've gotten so many compliments on it and it's become a staple piece in my wardrobe. So cool to wear with these fancy lace pants and black sweater from Ann Taylor. The pants and top were purchased back in fall so they are probably out of stock by now. I would also wear this coat with jeans and a little black dress. So many different options and the color is a perfect hue to add to my wardrobe and yes, it keeps me warm and stylish!